Last night, as Jerry and I were getting ready for bed, we noticed something extremely creepy. A few days ago, Jerry wrote me a note on the bathroom mirror with a dry erase marker, and I hadn't erased it yet. Jerry has neat handwriting, and the note was written nice and straight. I asked Jerry why the heck he did that, and he had no clue what I was talking about. The kids were in bed, and we knew it wasn't them who did it. We were completely stumped. I don't believe in ghosts, or spirits, or any sort of paranormal activity, but seeing this happen on the mirror was freaky! I took the photo and called a few friends to ask their thoughts, but nobody had a clue. I had thought maybe it was from condensation, but that wouldn't have made the letters rotate the way they did. Besides, Jerry and I have been writing these notes to each other for 11 years, and this had never happened before! I couldn't sleep at all last night, because I was racking my brain trying to come up with other explanations. I couldn't think of anything at all that would have caused it. This afternoon, I called Thomas, and he was thoroughly convinced it was from condensation. I could understand condensation causing streaks and smudges, but not rotating the letters! Jerry had written, "WHO ARE YOU?" on the mirror last night, only half-jokingly, in case it was a ghost--and my brother drew some symbols on the mirror to just see if they shifted over time. So I decided to prove Thomas wrong by turning the shower on as hot as it would go, and see what happened (or didn't happen) to the things Jerry and my brother wrote. When I turned off the shower, I actually took a time-lapse video (a feature on the iPhone 6 that I never knew would actually come in handy!). In the video, you can see the letters move. I filmed for about three minutes, but the video is only a few seconds long. Watch the letter 'A' in particular. This morning, I was super tired from the lack of sleep, but I still wanted to try and get my long run done today. I knew Sarah was coming over tonight, and Kendall is coming over tomorrow, so I wanted to have some extra activity points. 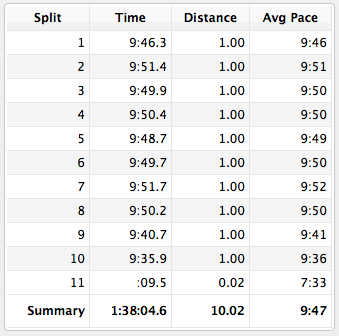 I had 10 miles on the schedule, and this was my last long run before the Runner's World Half & Festival next weekend. I decided to do a slightly different route today--basically run straight out for 5 miles, and then back. I was debating whether to run slowly and try to enjoy my last long run before the race, or to try and hit a certain goal. I decided to aim for sub-10:00 miles. As soon as I started running, I felt like I was going at a pretty good pace, but a quarter mile in, I saw my pace was in the high 10's. I picked up some speed, and tried to stay close to 10:00 without going over. I was really cold for the first couple of miles, and wished I'd brought a long-sleeved shirt, but after mile two, I felt much better. The temp was a perfect 41 degrees. I was hitting sub-10 on all my splits, and I was thrilled when it was time to turn around and head home. The last two miles were really tough because the sun came out, and I wanted to walk so badly; but I kept going, thinking how good I'd feel for hitting my goal of all sub-10's. Finally made it back to my house! This afternoon, Noah didn't have cross country practice, so I picked him up from school and we went on a run at the state park. We did the same route that we did a couple of weeks ago. It's 1.56 miles around, and last time, his pace was 12:42/mile. Today, he wanted to try to beat his time, and his pace ended up being 10:46/mile! That's a very drastic improvement, especially considering it's only been a couple of weeks. His next meet is on Saturday, so I hope he has a great race. Well, I've got to get my house clean, because Sarah and Ne are going to be here soon! That was SO FREAKY! I thought there was no way it could be condensation and what really freaked me out was that I thought I could read certain words like "girl" and "cookies" and maybe I watch too much Investigation Discovery but I was worried that a crazy person came into your house! I was just hoping that it would turn out to be your brother or someone coming in the house and playing a trick on you. That would be creepy with the lettering. Interesting. That is creepy yet interesting... Strange it had never happened in all the other times you have wrote notes on the mirror. Do have to say that is pretty sweet waking up to a note on the mirror tho! Great job getting in your last long run before the festival! I so wish I could be there - it looks like such a great event and a great way to meet so many other running/fitness/lifestyle bloggers. Enjoy - can't wait to hear about it! That is CRAZY about the letters on the mirror!!! Wow! I love reading your blog your running feats are such an inspiration. I was finally able to run a 5k straight on the treadmill. It was a long slow run but I did it. I've never been able to run for 35 minutes straight before and reading your blog has really helped me push myself and accomplish these things so thank you. I love the notes on the mirror but I do believe in ghosts and would have freaked out lol. That was insanely creepy!! I would think condensation would cause streaks...not rotating letters!!! So weird!! You are braver than I am. I'd be convinced that it was a ghost and wouldn't even think of spending the night in the house. lol. Wow, this Thomas guy sounds pretty on top of the ball! I seriously would have had a stroke if I'd seen that in the mirror, because I do believe in the paranormal! At least you did find the cause!! Whoa I would not be able to sleep without figuring out how the letters moved. 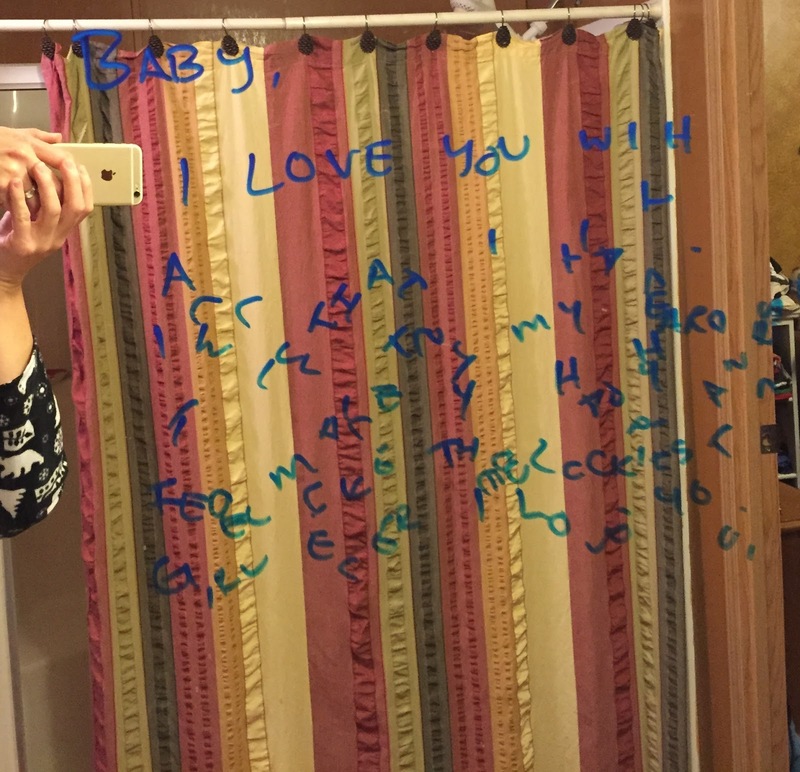 My husband and I write notes on our mirrors too, this has never happened either. At least now if it does I will know why! That is just the type of thing that would scare the pants of me. Did you see Paranormal Activity? That movie kept me awake for weeks. Good thing there's a rational explanation and you only had one night's sleep disruption. Thanks for the ghost story!